A quintessential meal to satisfy the appetite for breakfast, lunch or dinner. Healthy, quick and the perfect blend of spice to warm the chilly onset of Fall and Winter. Fried Eggs with Spicy Tomato Harissa Sauce may become your new go-to comfort food! Harissa is a versatile Tunisian condiment, typically sold in tubes or jars, yet it can easily be prepared at home: Blend red chili peppers into a thick paste with the addition of garlic, olive oil, and aromatic spices such as cumin, caraway and coriander. Depending on the heat level of the peppers, a spoonful of harissa can go a long way! 2 tbsp prepared Harissa, add more if you like it spicier! Heat a large non-stick skillet over medium heat, add the oil then the onion and saute 2 to 3 minutes. Add the tomatoes and harissa. Increase heat to medium-high, and simmer 3 to 4 minutes to reduce the liquid. Now, turn the heat to medium-low, carefully add the eggs, salt and pepper and cover. Cook until the top of the eggs set, about 4 to 5 minutes, or to your liking. Garnish with chopped parsley, chives or cilantro. 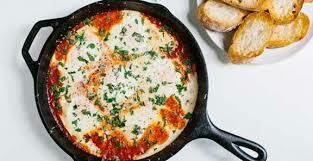 Serve with good, crusty bread! Posted on October 29, 2013 October 31, 2017 by Table Without BordersPosted in Breakfast Foods, Main Dishes, RecipesTagged Eggs, Fried Eggs in a Spicy Tomato and Harissa Sauce with Crusty Bread, Harissa, michelle swift, Tunisia.